Motoreaper v5.0.2 is a small application for windows computer which allows you to remove the android frp protection from the motorola smartphone and tablets. In order to use the motoreaper tool properly, you need install the Universal Adb Driver on your Computer. Once driver is installed you can successfully connect your device to the computer, and launch the motoreaper tool on the computer. Once motoreaper is launched, click on the lets get started button. Now boot your motorola smartphone into the bootloader mode (by pressing volume down + power key ). Once your device is entered into the bootloader mode, it will automatically start the remove process. 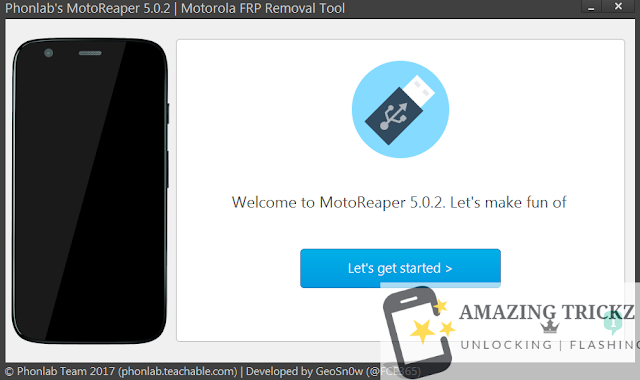 During the FRP removing process, the motorola device will reboot automatically and you have to press on the next stage button. After clicking the button, it will lookup the motorola device to reboot and lastly it will execute the Android Exploit on the motorola smartphone. In the next step it will ask you to enable the adb debugging on the motorola smartphone. On your device, tap on allow and it will successfully unlock the device.